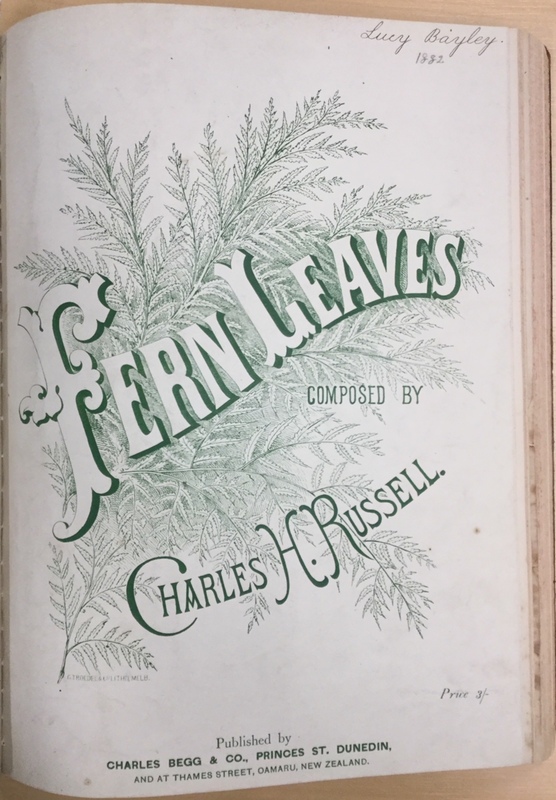 The Hocken sheet music collection houses some interesting titles and volumes, including a number of owner-bound volumes, which are, on the surface, intriguing collections of random choices of sheet music. We collect these from a number of places including auctions and sales, with a handful of volumes donated to us. The purpose of owner-bound volumes was to collate collected music, keeping it tidy and in good condition, and easier to use on a piano stand. Cultural capital was also important. Many had gilt lettering and leather binding, so were attractive to display. Also (like a contemporary music collection), they displayed the owner’s tastes in sheet music, and the subjective choices and organisation are displayed by the indexing, which was often hand-written. 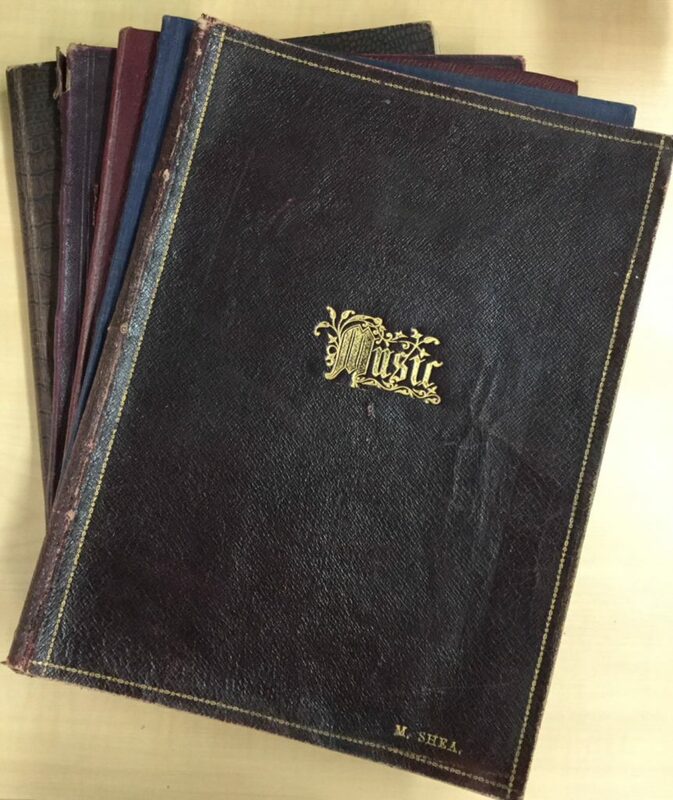 These volumes tell stories of what was fashionable in music at the time, and available to purchase locally from dealers, although all volumes included sheet music that was purchased overseas, and therefore not widely available here. 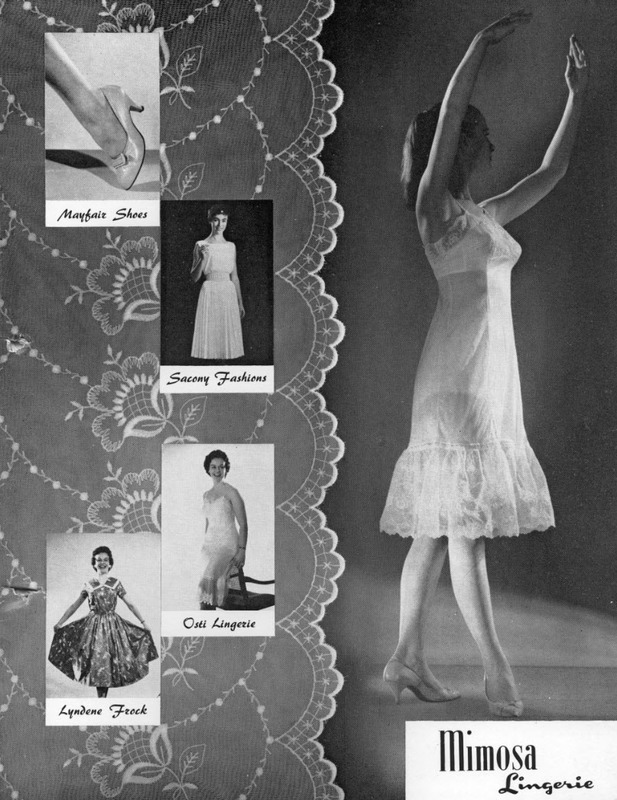 The content throughout all the volumes is a mix of song (piano-and-vocal), and music (piano only), and much of this is related to dance. However, Aline Maxwell-Scott, writing about jazz-age owner-bound volumes in Australasia, thinks women’s owner-bound volumes were more likely to include songs than men’s, although our volumes belonging to William Larnach show a substantial number of piano-and-vocal songs. 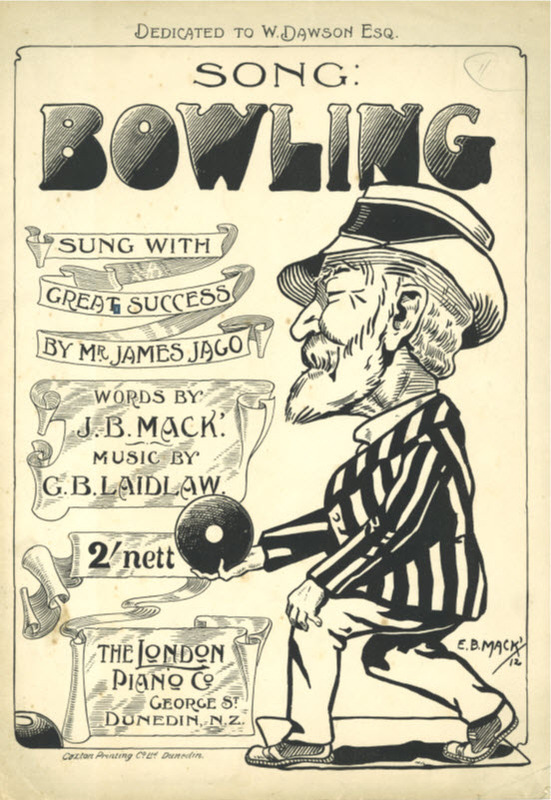 The practice of owner-binding sheet music dates to the nineteenth century, and is linked predominantly to both the mass publishing of sheet music, and to domestic amateur music making. This was largely the realm of women, as they were the primary providers of musical entertainment in the home, according to Maxwell-Scott, and she notes that playing the piano was an accomplishment that enhanced marriage prospects. The female acquisition of musical skills maintained the social values of the developing middle classes, which was especially true for the Antipodes, where applying European cultural values to the uncivilised environs of the colonies was valued greatly. The piano was even considered “a kind of gigantic hearth God, to be placated by polish and performance, its altar covered in lace and candles”. It was also women who drove the nineteenth-century market for sheet music and popular songs, and increased demand led to the rise in the production of this music, and expansion of the music industry. The overall content of owner-bound volumes is eclectic, with different genres represented – sentimental song, classical piano pieces, operatic arrangements, comic bawdy numbers, and songs relating to military or war subjects. Many were popular songs of the day. There is also the aesthetic nature of sheet music covers to consider, as many are beautiful, and still in extremely good condition. Over time, owner-bound volumes became more scarce, with a drop in number from the 1920s, correlating with the rise of the gramophone and the 78rpm disc. The earliest owner-bound volumes in Hocken’s sheet music collection bear William Larnach’s name embossed on the cover, and date to around the 1880s. Although there is no date for the binding, it is likely to have occurred relatively quickly, as a way to collate the music, and also to signify cultural status. Larnach’s volumes are interesting, containing many songs from Sheard’s comic song annuals which were published overseas, although one piece, ‘The Old Flag’, was published in Dunedin by G.R. West, at 18 Princes Street. Unlike later owner-bound volumes, there is not much information annotated on the sheets, but the titles make for interesting reading! Title from William Larnach’s owner-bound volume. 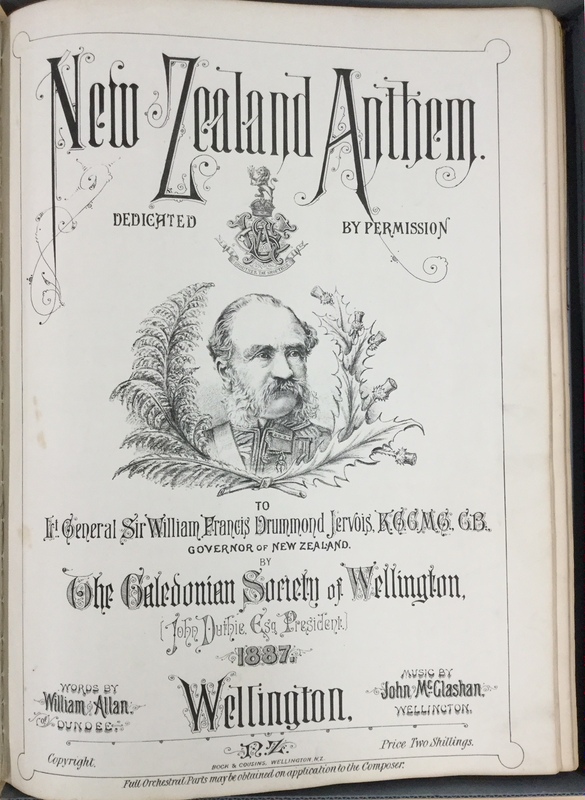 ‘New Zealand Anthem: Dedicated by permission to Lt. General Sir William Francis Drummond Jervois K.G.C.M.G., C.B.’ by William Allan and John McGlashan. Hocken Sheet Music Collection. Owner-bound volumes don’t always include local material, focusing on predominantly English or American titles. There are some exceptions, especially in one volume belonging originally to Lucy Maude Bayley, which features some rare local sheets by Charles H. Russell, published by Charles Begg in Dunedin. However, even if the music is not from New Zealand, the dealers were, and dealers’ stamps tell you what music was available at what dealer, with stamps for Begg’s and Terry’s, and later, Muriel Caddie (among others) frequently appearing. Also, these owner-bound volumes were predominantly collected by local individuals: their initials regularly appear on the front of the volumes, and the sheets are annotated with their names, and (often) addresses, so we can try and trace their lives. However, due to the sheets being trimmed for binding, these details are often lost, or at least severely cut, making it harder to locate owners. Some volumes stand out and tell stories through the addresses, and annotations given. Harry Kelk’s owner-bound volume is one. Kelk (a teacher) emigrated to New Zealand from England in the 1870s, aged 16. His owner-bound volume has music sheets collected over a number of years, and although they have no dates printed on them, a couple have the dates hand-written on them. One of the later sheets (‘The Mikado Quadrilles’) has the inscription ‘H. P. Kelk, from his aunt Ellen, 1906’, while others have dates in the 1880s. There are some interesting inscriptions too – ‘Myosotis’ reads “Don’t forget the night you heard this first! Never!” and “A thing of beauty is you forever.” These sheets are all piano music, and predominantly waltzes. Title from Harry Kelk’s owner-bound volume. ‘Myosotis’ by Caroline Lowthian. 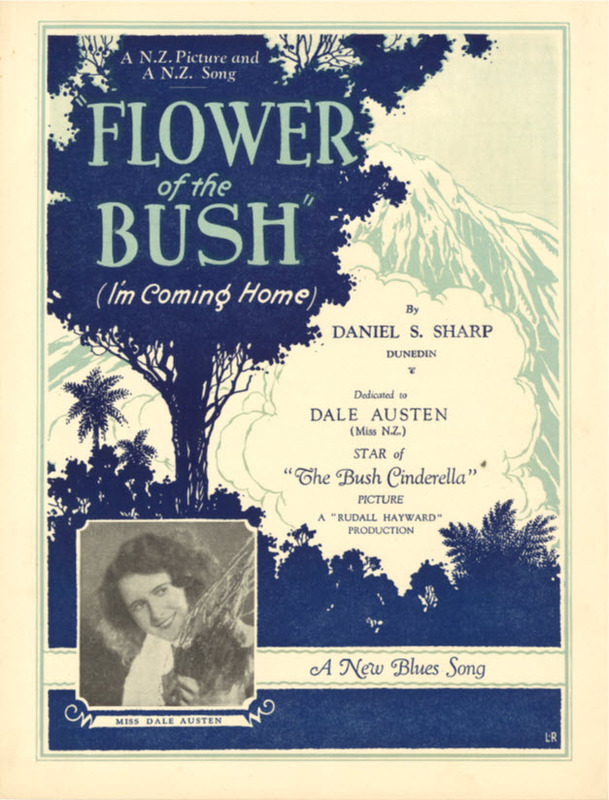 Hocken Sheet Music Collection. Another recently-acquired owner-bound volume was originally compiled by Lucy Maude Mary Bayley, who was born in 1869 to Frederick and Lucy Bayley. Her volume features some interesting sheets, mostly piano music: polkas, airs, mazurkas, melodies, and studies. Four of these music sheets were locally published – ‘The Daily Times Mazurka’ (a polish folk dance in triple meter), was published and available from Kelsey’s (who were taken over by Begg’s in 1883), ‘The Colonial Mazurka’, published by G. R. West, and two rare pieces by Charles H. Russell – ‘Fern Leaves’, and ‘The Silvery Spray Mazurka’, both published by Beggs. While most of these songs are undated, we can get an estimated publishing date, as Lucy Bayley annotated some titles with a (purchase?) date. Title from Lucy Maude Bayley’s owner-bound volume. ‘Fern Leaves’ by Charles H. Russell. Hocken Sheet Music Collection. Finally, the three owner-bound volumes of Jessie Bell McLaren provide a slightly more modern comparison. McLaren was born around 1896 to David and Christina McLaren of 15 Crown St, North East Valley (her address is annotated on one of the music sheets). Her three volumes of sheets, titled Selections and Songs on the cover, still have their binders’ stamps, which identify Whitcombe and Tombs on Princes Street as the binder. 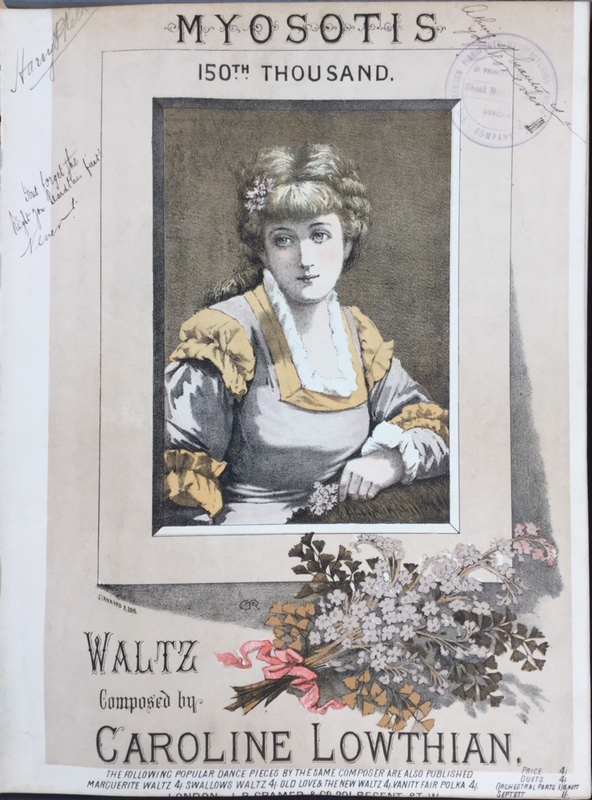 These volumes are a diverse collection of mostly popular songs from theatre shows, but include a number of piano-only pieces, mainly waltzes and foxtrots. McLaren dated these pieces, so we can see the acquisition date, which was during the First World War. There are a few war-related sheet music titles, with some directly related to theatre productions about the Great War. While many of these titles were purchased in Dunedin or in other New Zealand centres (dealers stamps give the location), a number were sent to her from England. Written on the back of one sheet is a letter from a loved one, Bill, who sent the sheet from Stevenage, England during that time. This could be a co-incidence, but Jessie Bell McLaren married chemist William Francis Stanley Pollock in 1922, moving to Highgate. Is he the same Bill who wrote the letter? 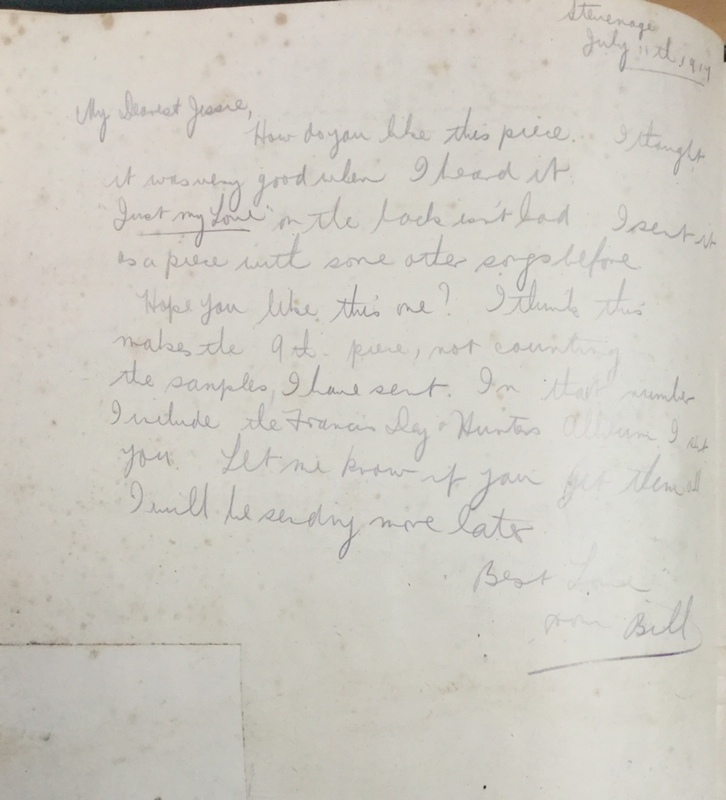 Letter from Jessie Bell McLaren’s owner-bound volumes, from Bill to Jessie. Title from Jessie Bell McLaren’s owner-bound volumes. 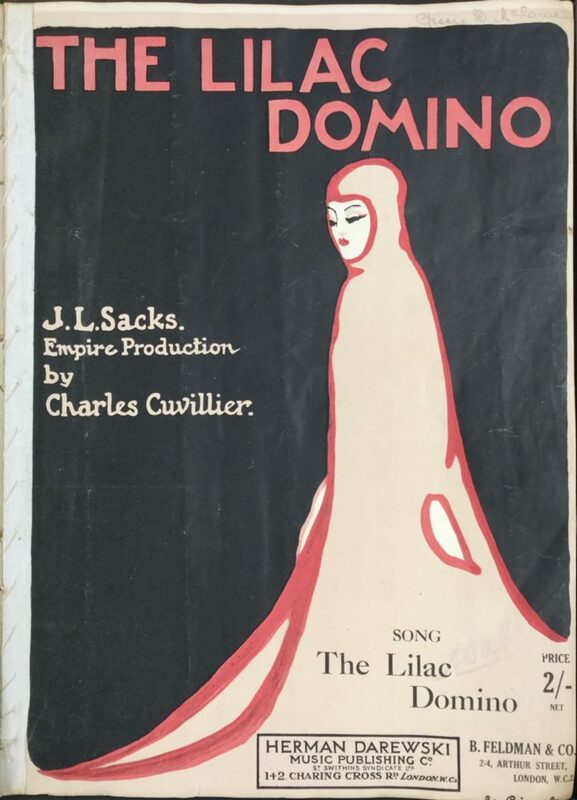 ‘The Lilac Domino’ by Charles Culliver. 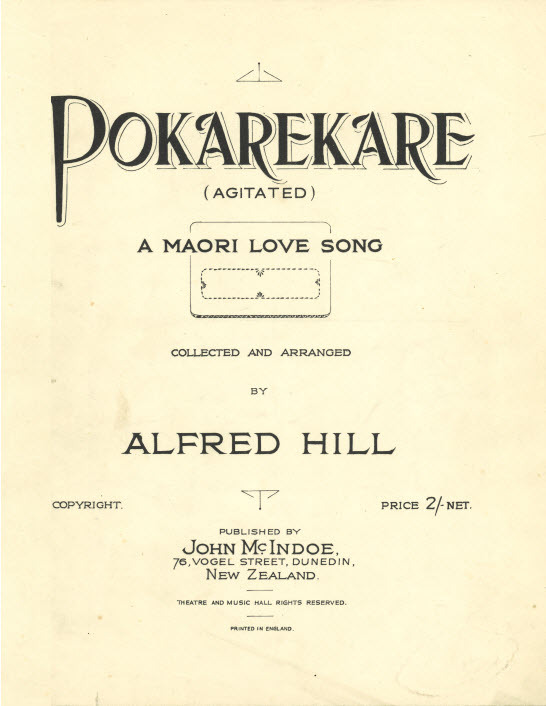 Hocken Sheet Music Collection. The remaining owner-bound volumes in Hocken’s sheet music collections date between the late 1800s and the 1950s, and all have thought-provoking selections of international, and locally-produced music. Not all are listed on the University’s Library Search|Ketu online public access catalogue, but we are working to make these volumes, and their contents, searchable. However, they can all be viewed in our reading room – please come and talk to our Curator, Music and AV if you would like to view them. Title from Jessie Bell McLaren’s owner-bound volumes. 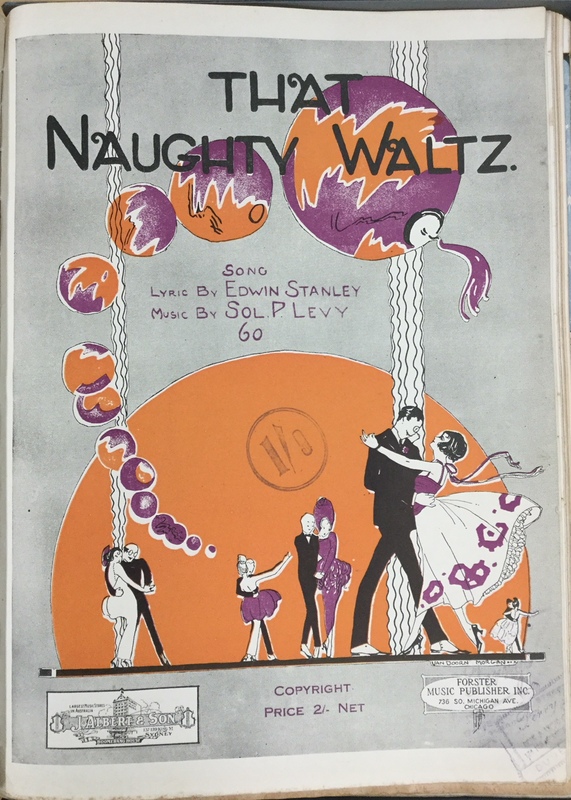 ‘That Naughty Waltz’ by Edwin Stanley and Sol. P Levy. 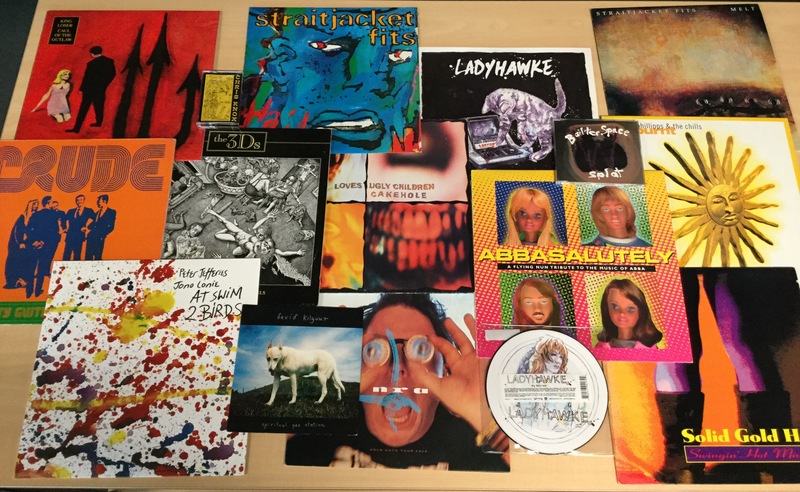 Hocken Music Collection. Note the Dunedin dealer’s stamp in the lower right hand corner, and that the sheet has been trimmed. Maxwell Scott, 2016, p 191. Crisp, L. quoted in Maxwell-Scott, 2016, p 191. The Verlaines have been a keystone band in the Dunedin music scene since their inception in 1980, and fully-fledged beginnings in 1981, when they were found regularly playing gigs in Dunedin’s Empire Tavern’s third floor concert venue. The band has undergone a number of lineup changes over nearly four decades, but the members pivot around songwriter and vocalist/guitarist Dr Graeme Downes, who has been the constant band member since the beginning. 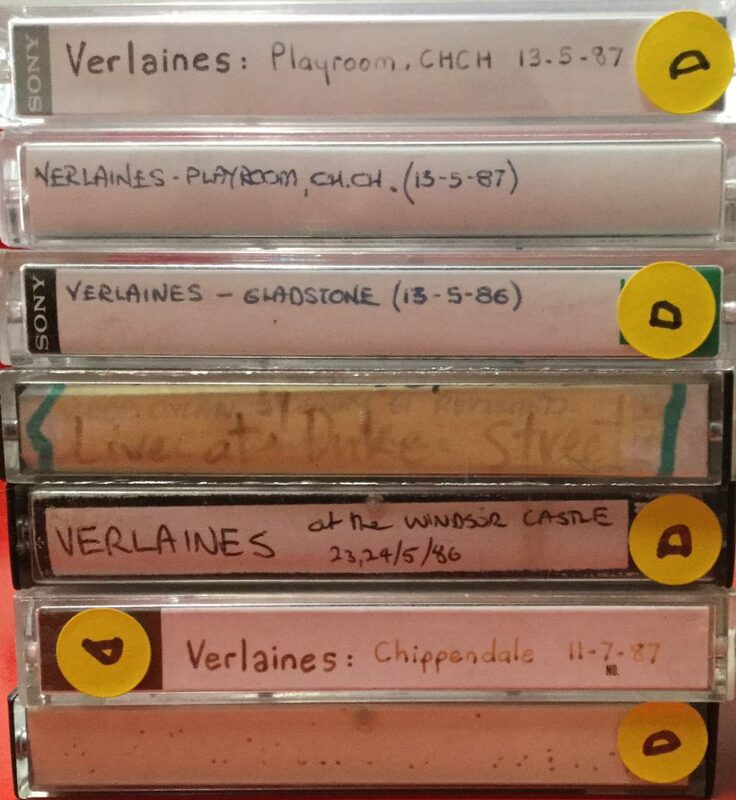 The first 15 years of The Verlaines in particular was a productive time for the band, when their sound was developing, and they released some of their most well-known recordings: the songs Death and the Maiden, Crisis after Crisis, and Pyromaniac and albums ‘Hallelujah all the way home’, ‘Bird Dog’, ‘Some Disenchanted Evening’, and ‘Ready to Fly’. This particularly fertile time is documented in a collection of 33 performances on cassette tapes that Graeme Downes has deposited with Hocken’s music collections. The performances date back to 1981 with a cassette titled ‘Live at Duke Street’ and continue throughout the 1980s, capturing the band in the first decade of their career in exotic locales such as CBGB’s Nightclub in New York, and (arguably) less glamorous settings like Wagga Wagga in New South Wales. This collection of performances documents the band as they develop as performers, and Downes, as he develops as a vocalist and songwriter, imbuing his songs with increasingly sophisticated and complex structures and ‘musical tricks’ – no doubt reflecting his own study in classical music at the University of Otago. 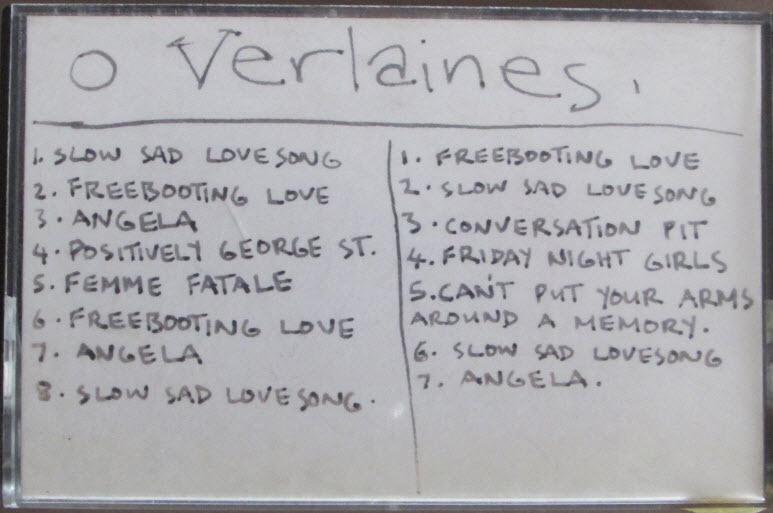 The live performances also capture the changing line-ups of The Verlaines, whose sound modifies slightly with each iteration of the band. 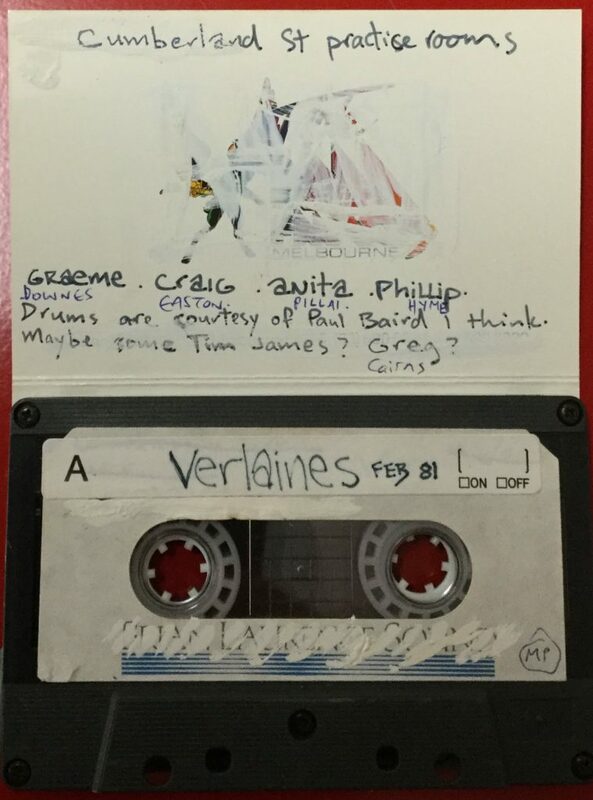 The earliest cassettes document the initial line-ups (possibly with Downes, Anita Pillai on keys, Craig Easton on guitars and vocals, Philip Higham on bass, and either Paul Baird, Tim James, or Greg Cairns on drums). The band give it their all, and finding their way around Downes’ material which includes later Verlaines classics such as Slow Sad Love Song (the first song Downes ever wrote in 1980 as a response to a friend’s passing), and a faithful cover of Velvet Underground’s Femme Fatale – one of the interesting oddities on the 1981 ‘Rehersals’ tape. By 1985-7, the line-up is one of the most well-known (Downes, Jane Dodd on bass, and Robbie Yeats on drums), and they have just released ‘Hallelujah all the way home’, and ‘Bird Dog’ to excellent press. They are hitting their stride in the live setting, and it shows. 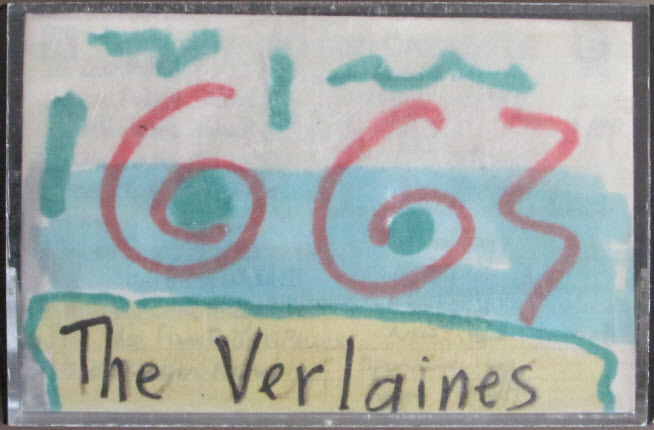 The Verlaines, It was Raining. Live at The Playroom, Christchurch, May 1987. There are many highlights in this collection. 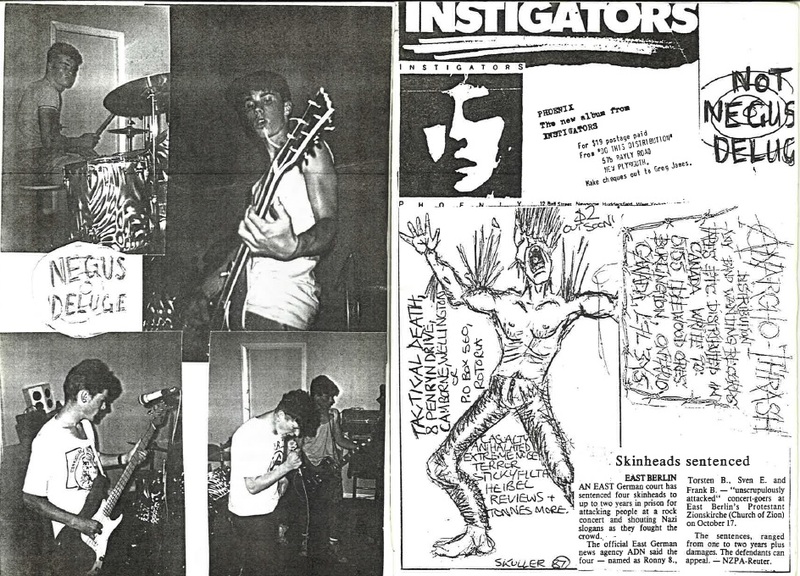 One favourite performance is the band’s spirited take of Pyromaniac at Reckless Records in Chicago (date not recorded, but likely in the early 1990s). There is a punkish spontaneity to this entire show, and Downes’ vocals are spot-on, as is the band’s performance.) 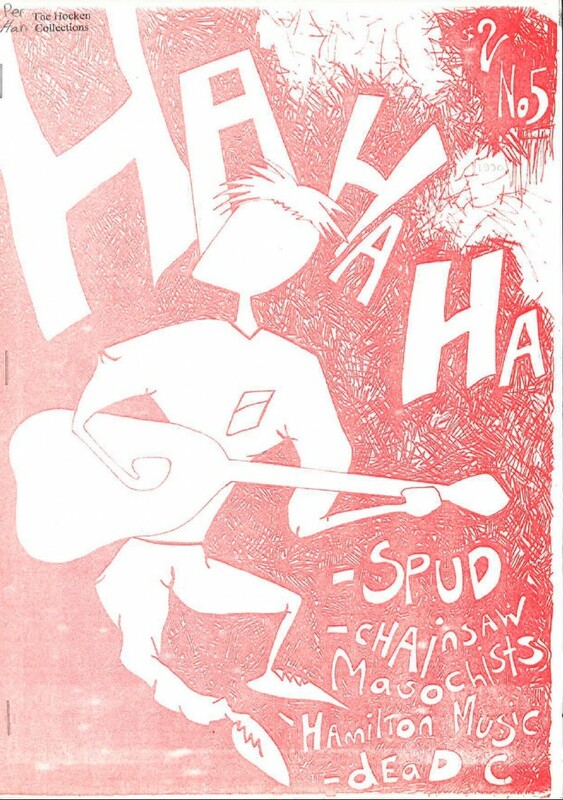 Another is possibly the only recorded instance of Graeme Downes performing with Straitjacket Fits, singing She Speeds at Chippendale House in July 1987 (Shayne Carter returns the favour by performing The Verlaines’ You Cheat Yourself of Everything that Moves) before the Verlaines set for the evening. This is a particularly emotive performance, as it was Downes’ wedding reception! Yet another highlight is a Christmas 1990 show at the Savoy in Dunedin, where the show ends with a dynamic version of Lying in State, which was a popular show closer for the band. By this time the line-up had changed again: Jane Dodd and Robbie Yeats had departed, with replacements Steve Cournane (drums), and Mike Stoodley (bass) taking over their roles in the band – bringing a slightly different feel to the music. The collection stops around 1993, at a point when The Verlaines (now Downes, Darren Steadman on drums, Paul Winders on guitar and backing vocals, and Mike Stoodley on bass) are no longer with Flying Nun, but have signed to Slash Records, an LA-based independent record label. One of the later recordings of the band is an interview with KALX Radio in Berkeley (part of the University of California), where they discuss their (then) new album, ‘Way out Where’, and the band’s history so far. The interviewer discusses Downes’ songwriting, and compares his writing style to Cole Porter or George Gershwin, while stating that The Verlaines ‘play like a punk band most of the time,’ a statement that still applies to the band today. The physical cassettes are still in good condition for items of between 30 and 40 years old, although the materials are ageing. 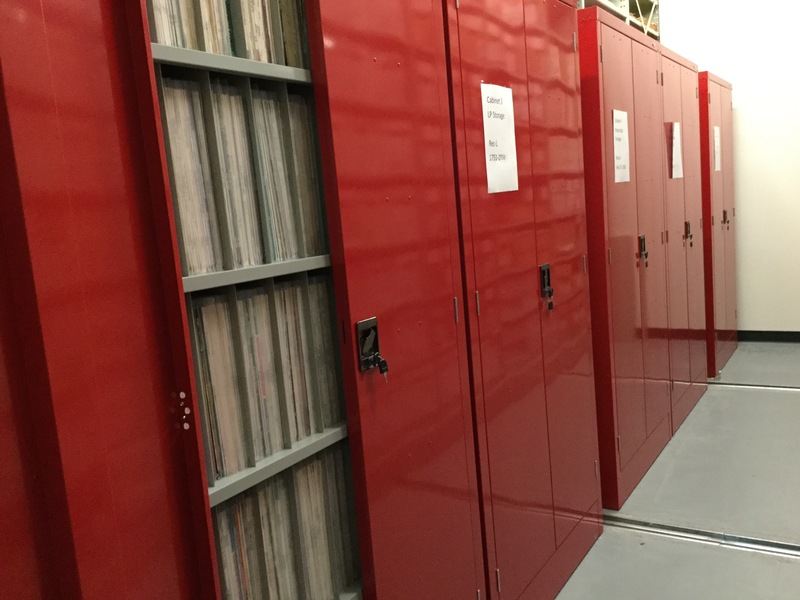 They are kept in a temperature-controlled vault at Hocken Collections to mitigate any potential issues with magnetic formats (such as sticky shed syndrome). All of these recordings have been digitised to WAV files for access, as the age and fragility of the cassette tapes means further playback could damage them. For any access to this content, please contact the Music and Audiovisual Curator at Hocken Collections for further information. September is the month of the APRA (Australasian Performing Rights Association) Silver Scroll Awards, an event celebrating New Zealand songwriters and composers. 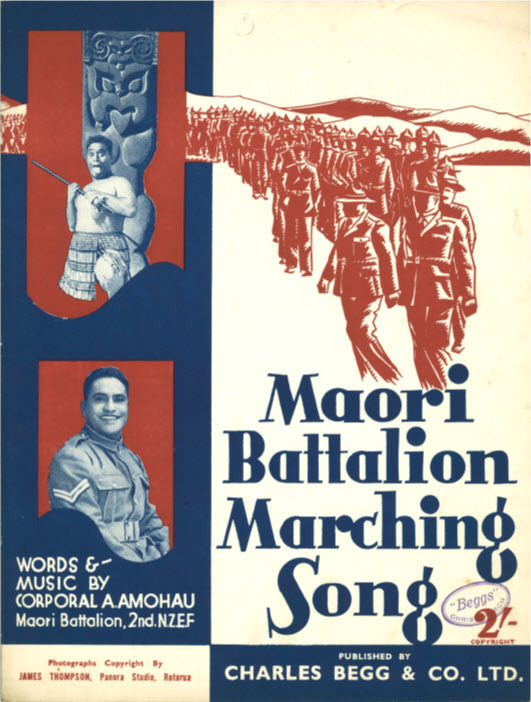 A number of awards are presented during this ceremony: the prestigious Silver Scroll award, recognising “outstanding achievement in the craft of songwriting,” the SOUNZ contemporary award recognising “creativity and inspiration in composition by a New Zealander,” and the APRA Maioha Award which “celebrates excellence in popular Māori composition, to inspire Māori composers to explore and express their culture and to increase awareness of waiata in te reo Māori throughout Aotearoa.” Also presented are the APRA Screen Music Awards – the APRA Best Original Music in a Feature Film and APRA Best Original Music in a Series Award, both of which celebrate New Zealand’s screen composers. In 2017, the APRA Silver Scroll Awards are being held in Dunedin on September 28th – a first for the city – and it is shaping up to be a Dunedin-centric awards ceremony. According to the APRA website, Dunedin has more songwriters per capita than anywhere else in New Zealand, and this year Port-Chalmers based singer-songwriter Nadia Reid, is nominated for her song ‘Richard’. As the Silver Scroll Award itself is to celebrate songwriting, the nominated songs are performed not by their writers and composers, but by other musicians in a different style to illustrate how a song stands on its own merits, regardless of genre. A musical curator selects the artists to perform the tracks, and for the 2017 Awards, Dunedin’s own Shayne Carter (DoubleHappys, Straitjacket Fits, Dimmer) will be undertaking this role. Another link between the awards and our Southern city are the 2017 inductees to the NZ Hall of Fame: The Clean (including founding member Peter Gutteridge), whose contribution to local music history can never be understated. Hocken’s own music collections have a connection to the Silver Scroll Awards – 190 45rpm discs of Silver Scroll nominated (and winning) songs from between 1965 and 1976 were donated in 1977. These songs represent the eclectic nature of songwriting from the time, with tracks from Blerta, The Maori Volcanics, John Hanlon, Steve Allen, Rockinghorse, Shona Laing, Ray Columbus, The Fourmyula, and Maria Dallas included in the nominations, along with Jay Epae, Lutha, The Moving Folk, (the wonderfully named) The Village Gossip and Garner Wayne and his Saddle Pals. 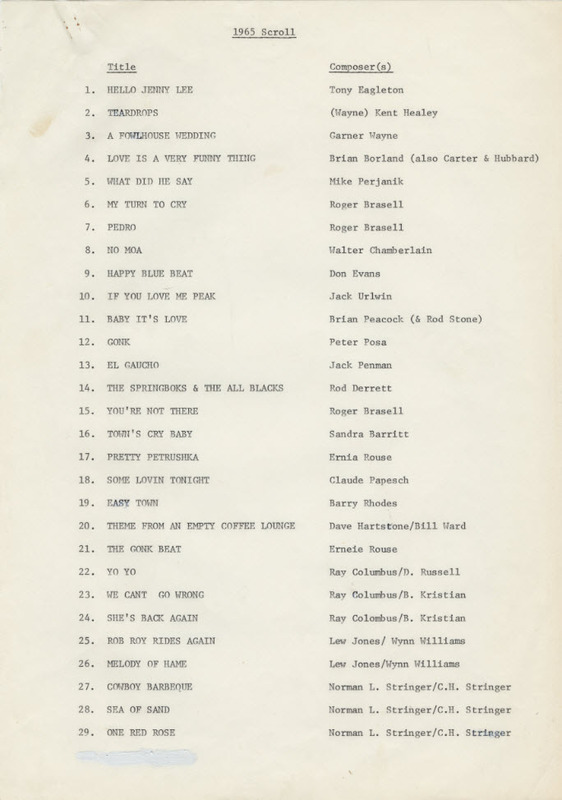 Accompanying lists of the nominated songs (also provided from APRA) give an indication of how many songs were nominated each year, and are a great resource for researchers looking at New Zealand popular music of the mid twentieth century. Our wider music collections also include Silver Scroll nominated material from this period and later on 45rpm disc, CD and cassette, including Lea Maalfrid’s 1977 winning song ‘Lavender Mountain’ – the first Silver Scroll Award ever presented to a female songwriter. However, the core APRA collection brings together these nominated songs as a group to represent a time capsule of material nominated for the Silver Scroll. 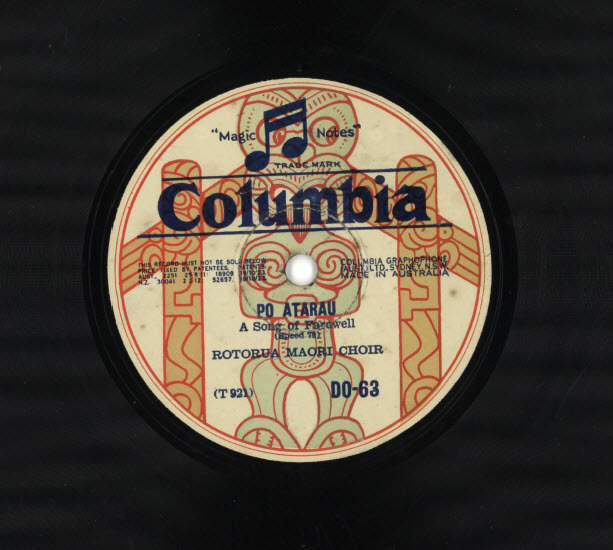 The song digitised here is by The Blue Stars (later The Bluestars), an Auckland group that began in the early 1960s during the band members’ time at Auckland Grammar. In 1966, they released ‘Please Be A Little Kind’ b/w ‘I Can Take It,’ a record that charted at no. 12, and gained radio airplay. The Blue Stars disbanded the following year, but ‘Please Be A Little Kind’ has kept the band firmly in New Zealand music history due to the song’s nomination for a Silver Scroll. 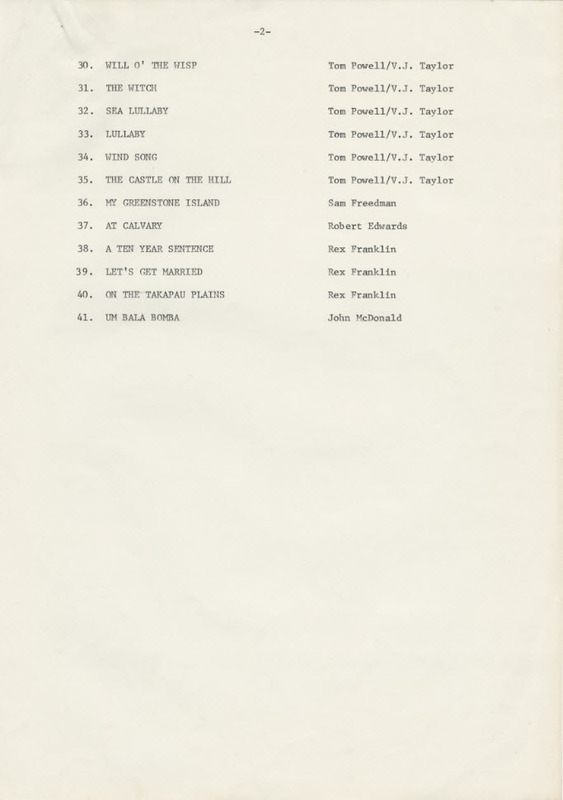 Below is the 1965 list of Silver Scroll nominees, which features some familiar names like Garner Wayne, Peter Posa, and Ray Colombus – names that reappear frequently in the nomination lists, and in the music charts. Good luck to all this year’s award nominees! It is with great sadness that we acknowledge the passing of Roy Colbert. Colbert’s contribution to the local music scenes in Dunedin can not be understated – his 2nd hand music store ‘Records Records’ (formerly located in the Terrace Houses in Stuart Street) was the place many discovered new and different sounds, often recommended by the man himself. His mentoring of and friendship with Dunedin musicians was legendary, his influence so strong that Chris Knox called him ‘The Godfather’ of the Dunedin Sound. Colbert was also a very fine writer on all topics, especially sport and music, and his stories about local and international artists were told with honesty, humour, goodwill, and (more often than not) his tongue firmly in cheek. 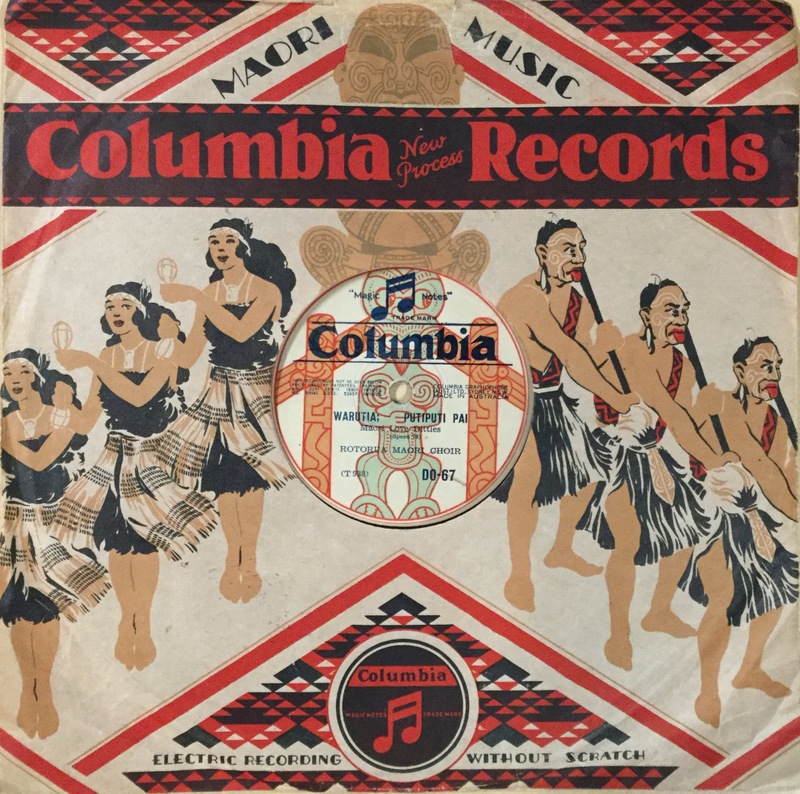 Roy Colbert was a supporter of Hocken’s recorded music collections from its establishment in the 1970s when we began purchasing items from Records Records. 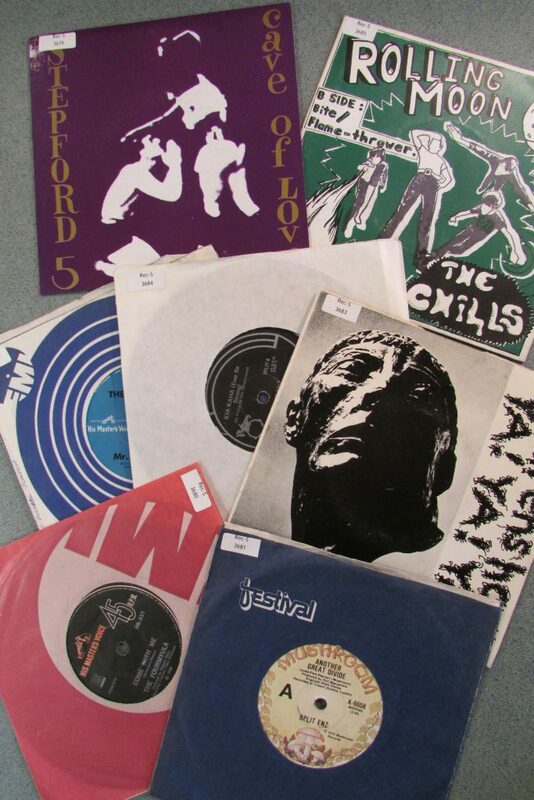 Most recently in April this year a small number of rare NZ 45rpm discs were purchased from Roy. Roy Colbert’s legacy looms large in Dunedin music, his kind and gregarious nature will not be forgotten, and he will be greatly missed. Xpressway: Records of a Dunedin independent record label (1988-1993). Hocken Archives, 94-156. 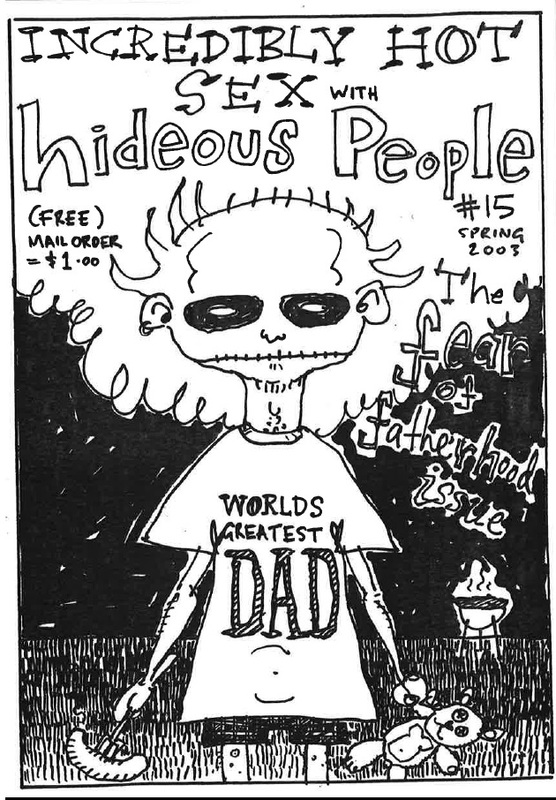 To celebrate Music Month in 2017, here’s a brief look at a collection of papers relating to a local Dunedin label. 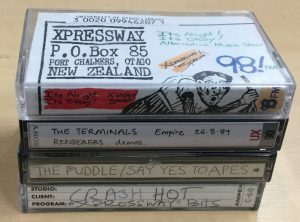 Xpressway Records began life as a cassette-only label in late 1987/early 1988, run out of Bruce Russell‘s home in Port Chalmers. Russell – archivist, writer, musician (in A Handful of Dust, and The Dead C) – began Xpressway Records with help from fellow musicians Peter Gutteridge, Alastair Galbraith and Peter Jefferies following Flying Nun’s 50% acquired by Mushroom Records. Russell worked for Flying Nun in their Christchurch offices for a time in the 1980s, and saw the label was moving away from its original ideals with the merger. The acquisition by a major label meant attention was focused on more commercial Flying Nun acts, and many were let go from the label. Russell was disillusioned by these decisions, and when artists like Jefferies and Galbraith were released from their Flying Nun contracts, he decided to in his words “show [Flying Nun] a thing or two,” as their music was just as valuable as the label’s more commercial counterparts. 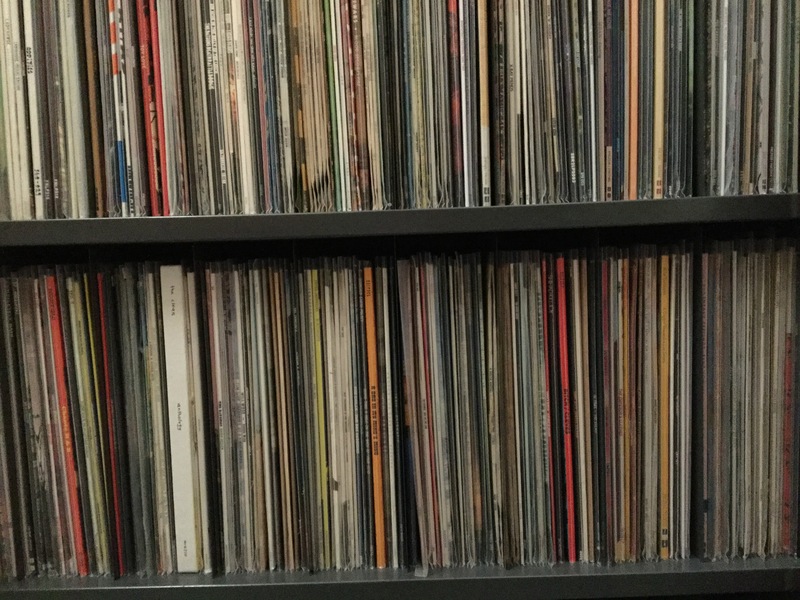 To give these artists and their music a home, he began Xpressway Records. In Russell’s opinion, “we should make the music available to those people that want to hear it, and if those people are a scattering of people all over the world in tiny niches within other national markets … fine… it’s just what we’ve got to do” (Russell, 2000). In 1993, Russell wrapped up the label, and, in 1994, gave Hocken the Xpressway archives. 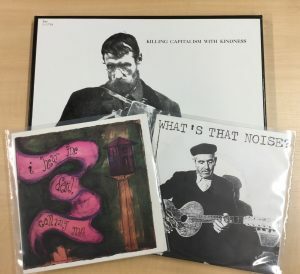 Russell also included other items in the donation: over 100 posters of local artists, and over 50 cassettes of live recordings of acts associated (mostly) with Flying Nun or Xpressway. Correspondence between Russell and musicians reveals the frustrations, irritants, and (in some cases) jealousies between different parties. While this is in the guise of official correspondence between artist and the label, it is often personal in nature reflecting the close knit nature of the Xpressway music community. It is also interesting to note that hand-written, typed, or faxed messages are on any blank surface: the backs of photographs, envelopes, flyers, aerograms (remember those? ), newsletters from Russell’s’ place of employment – it is all used. 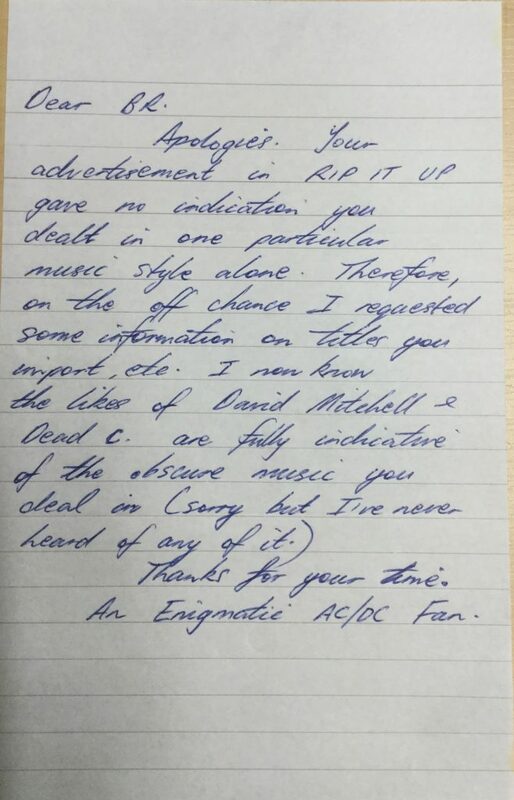 Much interesting material is contained in the folder relating to Flying Nun, with business correspondence again revealing the frustrations and everyday realities of supply and distribution between labels, especially those relating to finances. 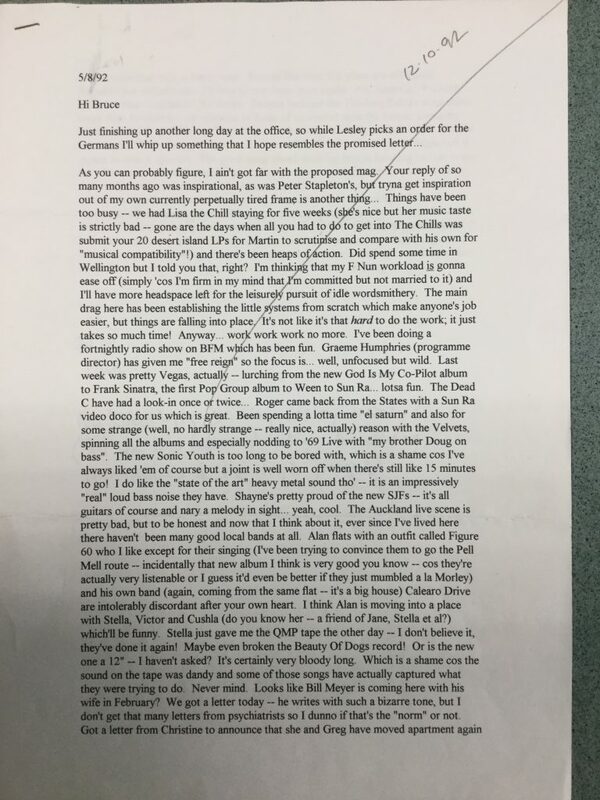 The letters and faxes between Russell and Flying Nun staff running the label day-to-day in Auckland are friendly and informal; they relate personal and industry stories and reveal common frustrations with business, distribution, and (quite often), the musicians. 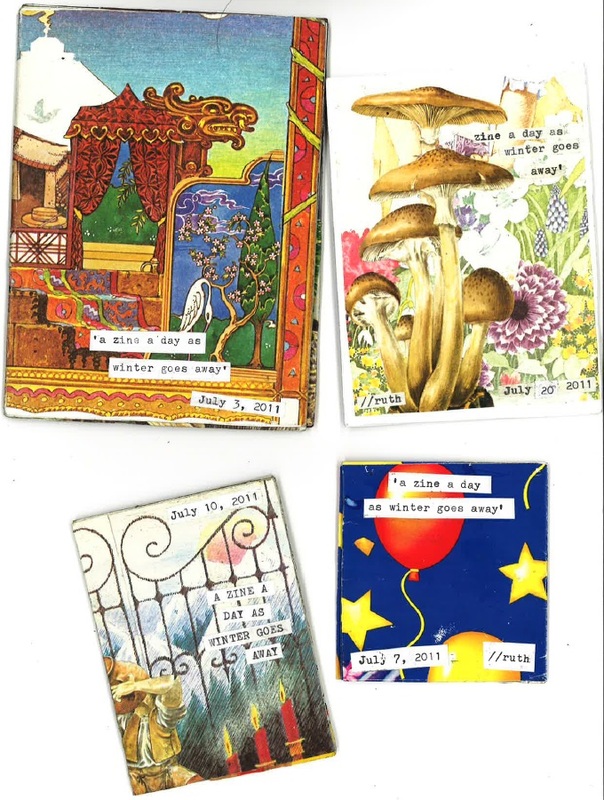 Other folders also contain interesting – and often hilarious – exchanges between the label and correspondent. 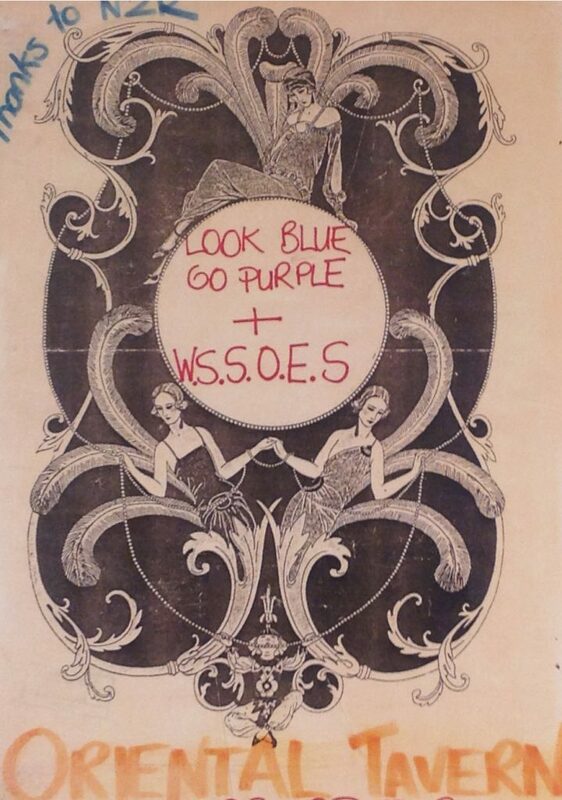 ‘Look Blue Go Purple + W.S.S.O.E.S’ poster. 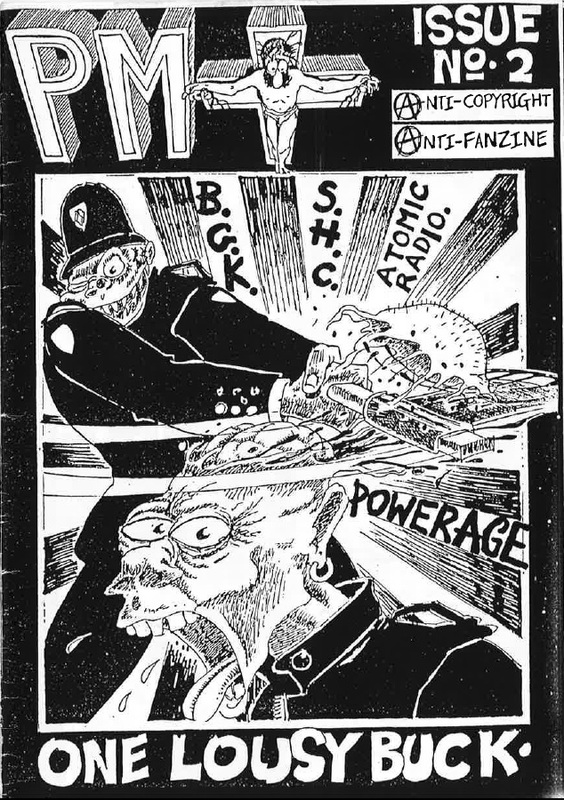 Hocken Posters collection. Along with the papers are the posters and cassettes that Russell donated. The posters relate to gigs and album releases, and highlight local bands and artists (many on or associated with Xpressway), and many are hard to find. 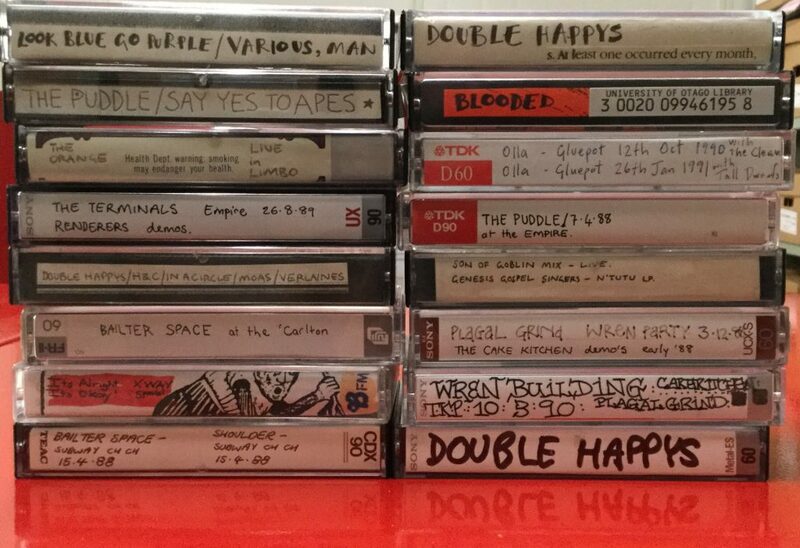 The tapes capture mostly live performances and some radio shows by local artists, but also artists from around New Zealand, in many different venues around the country. 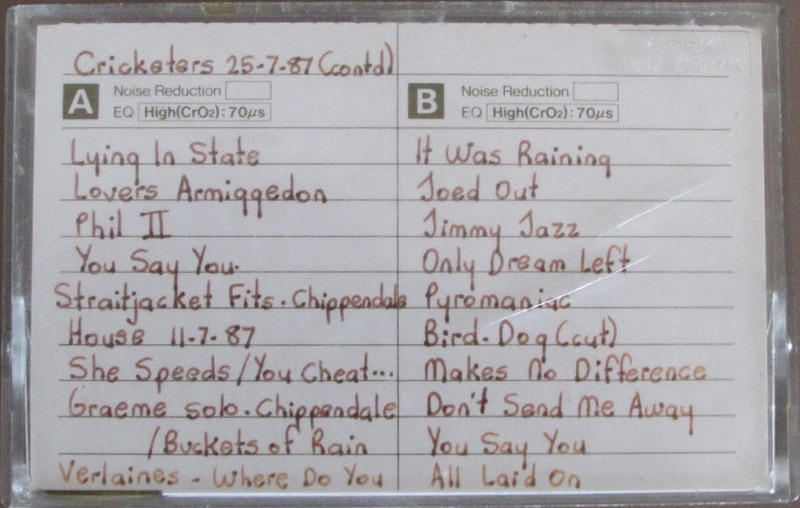 Some are recording sessions, or demos of material that may not have been released, and we are aware that these are possibly the master tapes for a number of recordings. Hocken has also recently acquired the Xway Vision VHS video of Xpressway (and associated labels) musicians performing in 1991. 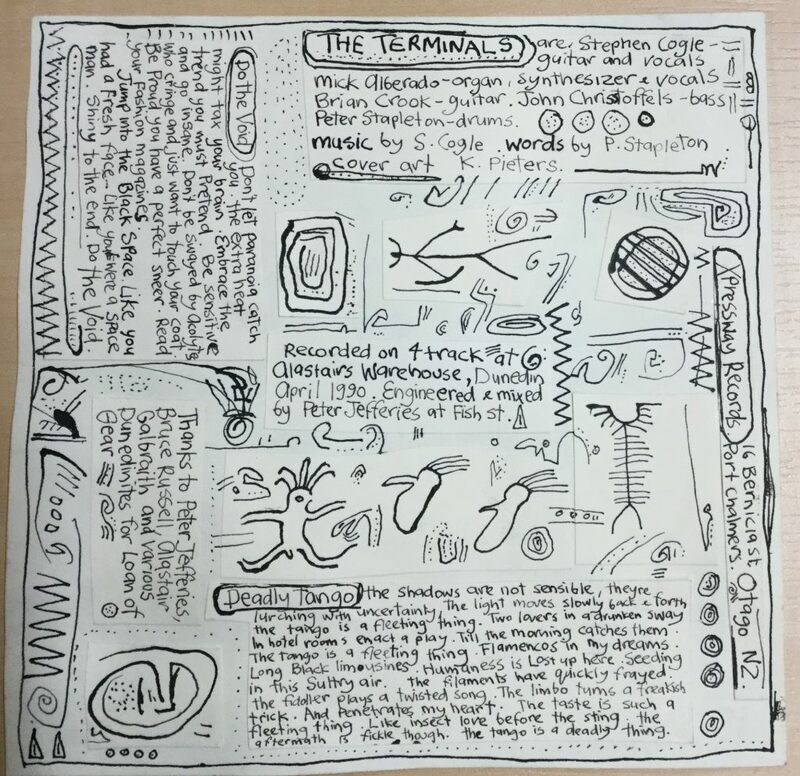 The Xpressway papers and recordings are used by students and other researchers, with material frequently published on the artists, the label, and the wider scene. The popularity of the label, and the music that emerged from it will only increase the intrinsic value of this collection. 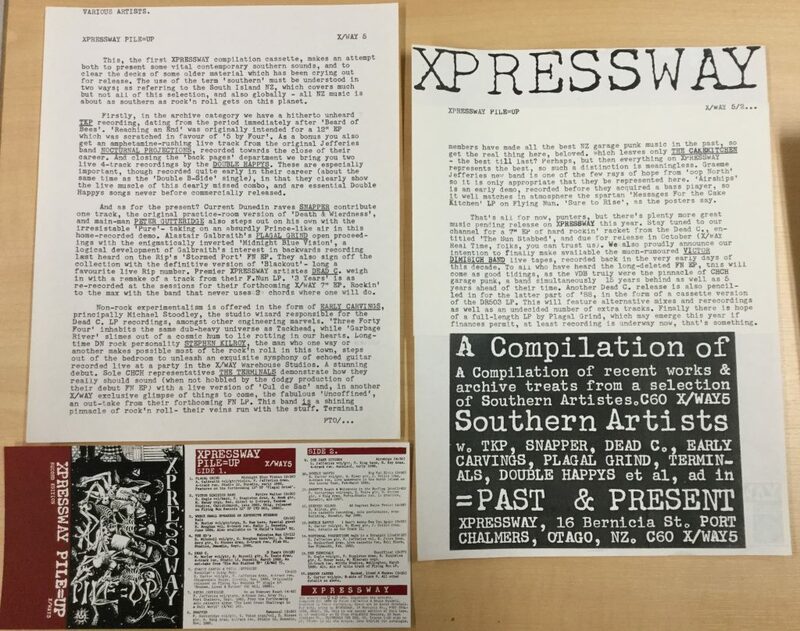 The Xpressway papers (and associated recordings) are a fascinating look at how an independent record label is run in a small music community, where artists often performed in each other’s bands, or on each other’s recordings.